Former president Robert Kocharian on Thursday announced that he will be re-entering Armenia’s political arena days after being released from pre-trial custody where he was remanded on charges of breaching Armenia constitutional order in relation to the March 1, 2008, post-election standoff when eight civilians and two police officers were killed, AzVision.az reports citing the Armenian media. 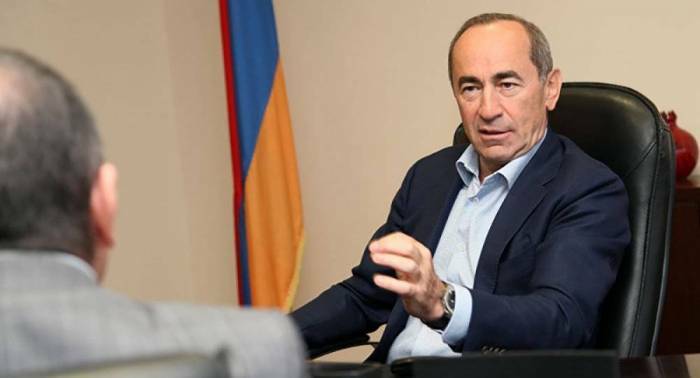 Kocharian said that he had no other choice but to enter the political arena, because he believes that the current government is too inexperienced to traverse what he called the complicated geopolitical realities facing Armenia. “They don’t understand,” said Kocharian referring to Prime Minister Nikol Pashinyan and his administration. “They don’t fully comprehend that challenges facing Armenia” in the current geopolitica situation. Armenia’s Criminal Court of Appeals reversed a lower court ruling that had remanded into custody until his trial. The charges are still pending against him. He lamented the fact that he was unable to speak about the specifics of his case, and wondered why there was a shroud of secrecy surrounding the charged. “I wish I could speak about the specifics of the case, because then I could outline the fabrications on which it is based,” Kocharian told Yerkir Media. He also went to reiterate his concerns about the so-called inexperience of the government to deal with the Karabakh conflict resolution process. He said that Pashinyan allegedly announced that he would not take part in the peace talks, when in fact, Pashinyan, from the time he assumed the leadership of government, has insisted on the inclusion of the so-called "Nagorno-Karabakh Republic" at the negotiating table, which was how the talks proceeded until Kocharian became Armenia’s president. The former president also boasted about the economic growth in Armenia during his tenure, and said the widespread corruption that is being attributed to his administration was exaggerated. “There is corruption in the United States,” said Kocharian to illustrate his view that the practice of looting the national wealth was commonplace all over the world. In discussing an upcoming rally in Yerevan on Friday called by Pashinyan, who has said that he will report on the first 100 days of the government, Kocharian was dismissive. “So what if 100,000 people gather at Republic Square. Is that a big percentage of the population?” Kocharian pondered during the interview.